Well, spring has well and truly sprung at Rootdown. We have been busy keeping up with the wild growth that has been happening now that the days are longer and the sun is warmer! In just a few weeks, small transplants of cabbage, broccoli, cauliflower, lettuce, radishes, squash, and so much more have gone from small and spindly to large and lush, and beans and peas have poked their leafy heads out of the ground. It is so exciting to walk out into the fields and see the plants doing so well! Of course, with the success of the cultivated plants comes also the success of the weeds, and for us, the main form of weed management comes in the form of our own two hands. We’ve been out combating weed pressure especially in the salad field, where not only will weeds compete for sunlight, soil nutrients and water, but make harvesting difficult – you try picking grass and lambs quarters out of a mixture of greens! They blend in masterfully. 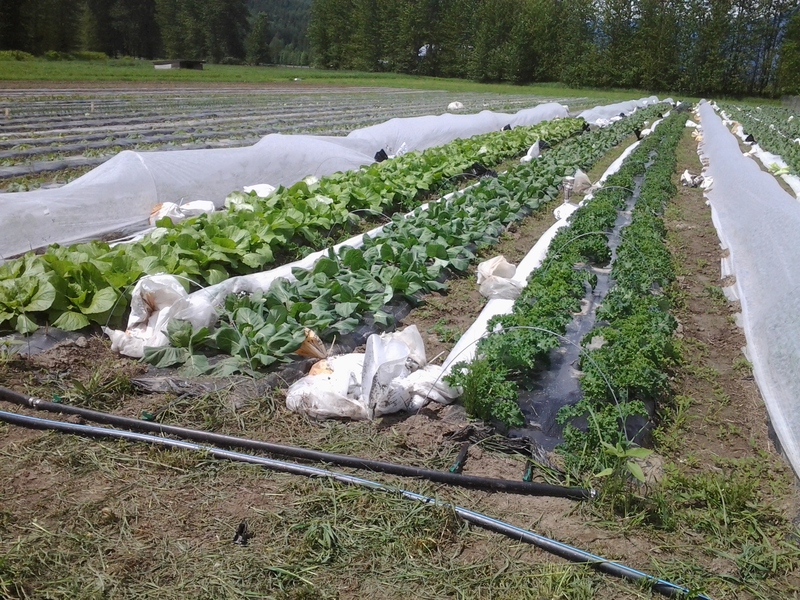 Weed pressure or no, the salad is bountiful at this time of year, and while there was a one week gap while we transitioned from our greenhouse salad, we are now harvesting from our fields, and the salad is so tasty and tender. 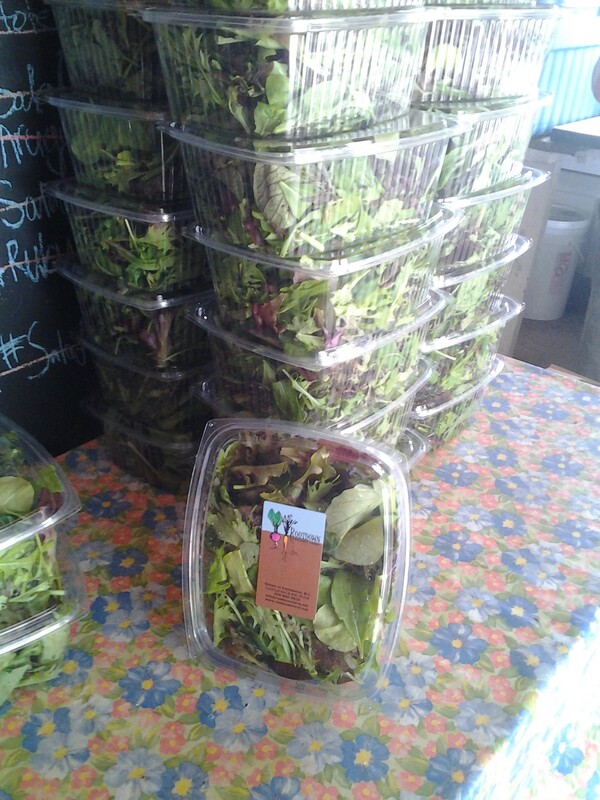 Our salad mixes include lettuce, mustard greens like mizuna, ruby streaks and arugula, and both green and red tatsoi. Right now, our salad mixes are sold to restaurants and grocery stores, but you will soon also see it at our booth at the Whistler Farmer’s Market. 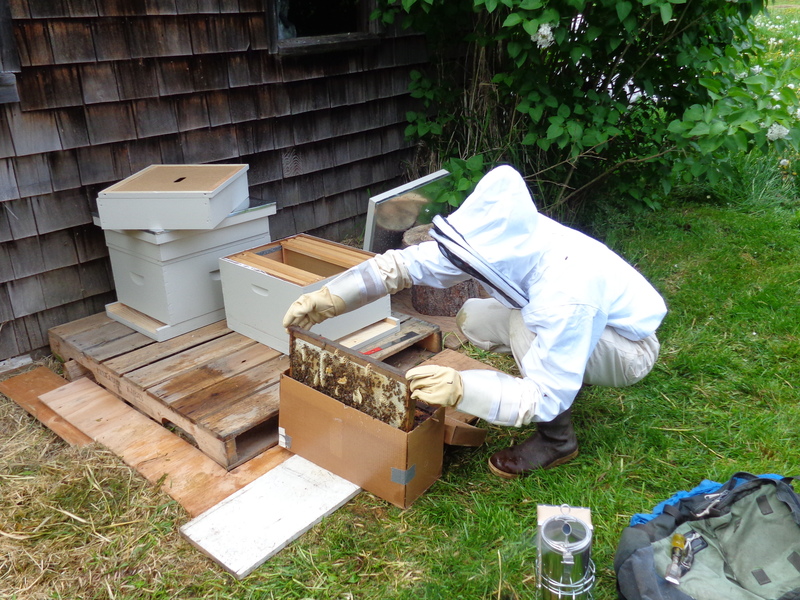 This week, we also got a great new addition to our farm family – two beehives! TJ, our resident beekeeper, introduced the bee colonies to their hives, and so far the bees seem to be doing well and adapting to their new home. Bees are very important to all kinds of agriculture, whether organic or not, as they pollinate a great number of crops, including squash, zucchini, and fruits like apples, raspberries and blueberries. With longer, hotter days to come, we know that our vegetables are off to a good start! Less than two weeks now before market season starts, and things are looking good.